On Run BTS! episode 62 the boys continued to play their games at the traditional Korean sauna and we finally got to see who faced the penalty! Run BTS! 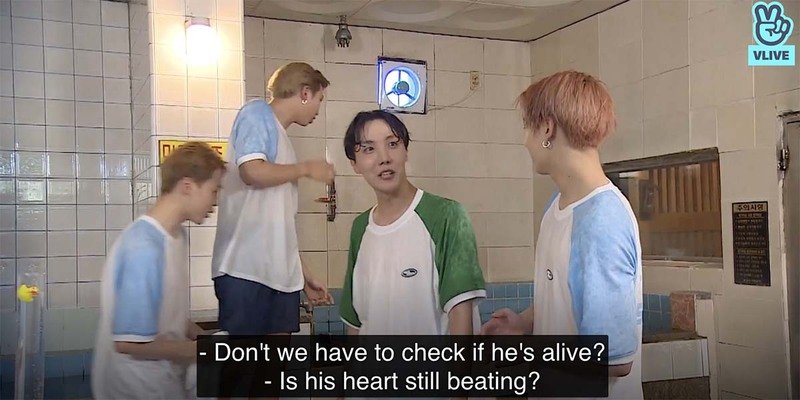 episode 62 picks up right where we left off last week, with Jimin and Hoseok still stuck inside the dry sauna. It seems like the heat might be melting their brains and they can’t seem to figure out what the answer is. Meanwhile, the others are just eating watermelon and talking about Jimin and Hoseok will never get out. Hilariously, they tell directors to just give the two hints so that they can end the round. The directors give in and start to help Jimin and Hoseok. After a little more guess work and hints they start to figure out what they’re doing. Outside the sauna, the others are quizzing each other. Jimin finally gets the answer right after a while and gets to leave. Cutely, the others worry about how long he was inside the dry sauana and start to feed him snacks. Of course, Jimin doesn’t want them at first thinking they’re supposed to saved. But his hyungs manage to get him to eat some watermelon anyways. Inside the dry sauna, Yoongi and Hoseok are about to face off. It seems like Yoongi gets the answer immediately and Hoseok is baffled. Yoongi must have been in there for less than a minute before he’s back out and telling the others his round was too easy. Yoongi tells the others what his question was and they agree it’s an easy one too. So Jimin decides to tell them what his was and then Namjoon gets it right away. The difference between Jimin’s amazed face and Hoseok’s upset face is just too much. Next round is Jin against Hoseok. Jin starts to figure out the answer but then he doubts himself. So the two start to try and figure out what the rest of the answer is. They end up getting some hints too and after some more thinking Jin figures out the answer. Meanwhile, Taehyung goes on a snack eating rampage. Which includes stealing watermelon from the other members and chugging their banana milk. The look on Namjoon’s face when Taehyung eats his piece will become iconic. When Jin escapes the dry sauna he tells the other how difficult their round was. Poor Hoseok is still stuck inside so Jungkook goes to cheer him on. Namjoon decides to join in too to help and Jimin is the only member from Team Seokjin to go inside. Outside the sauna, Jin explains his question to Yoongi and Taehyung as they all continue to eat the snacks. There’s a lot of repeating the question over and over again. And Taehyung continues to steal watermelon from Jin. Jin leaves Yoongi and Taehyung behind to go into the dry sauna as well. Which makes 5/7 BTS members squished onto the little bench. Finally, they all figure it out and Hoseok shouts out the answer so that he can leave. Taehyung heads into the sauna for an extra round against Jimin, while Jungkook, Namjoon, and Jin join in again. Because why not. This round is a little bit easier, and Taehyung gets it right after they guess a little bit. Team Seokjin is happy to learn that they won the second round. 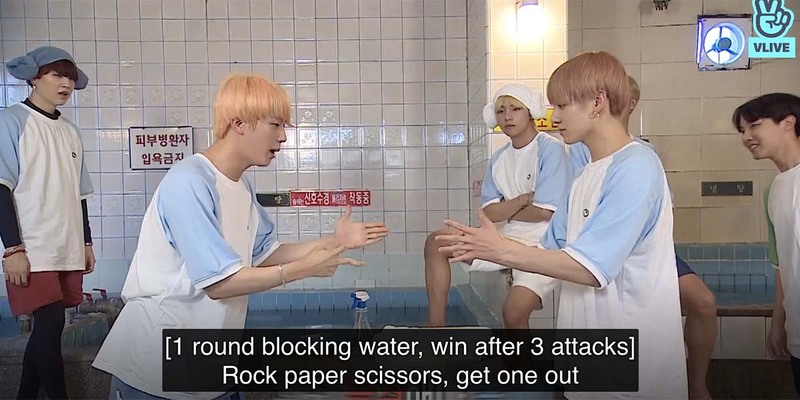 They learn that the next game is a bath relay game They have to play rock-paper-scissors and the winner attacks the loser with water, the one who attacks three times first wins. Then they have to fill the glass pipe with water using a towel and save the duck. And then one person in the team dives and is timed. Somehow they figure out the winner from all of this, I don’t really know. In the first round, it’s the oldest vs the youngest member. Really the best part about this whole game is the slow motion camera they use to show the members splashing each other. It’s a little bit like watching bay watch but silly BTS style. Team Seokjin gets to work trying to save their ducky. Filling the tube up is easy enough but then they can’t get the duck out. This results in Jin whipping water around to try and knock it out. They decide to change the rules that they don’t actually need to take the duck out and declare the first round to be a practice one. So now it’s Jin against Namjoon, because Yoongi says he’ll be no good at it. Jin is able to attack Namjoon twice before their leader gets a shot at the oldest member. He also manages to splash Yoongi in the process. Jin ends up winning the round again, and they quickly fil up the tube. Jimin goes to do his diving and stays under stays under for a fair amount of time but says that he could have done longer if he wasn’t out of breath. Taehyung is already preparing for his turn to stay under the water as Yoongi and Hoseok take a turn playing the relay game. Hoseok doesn’t do very well at first, which makes ARMYs the winners because we get to seem in soaked in water. This game basically turns into chaos and they just keep splashing each other until finally Hoseok gets Yoongi three times. Then it’s Taehyung’s turn to stay under the water and they’re all amazed at how long he can stay under there. Even his teammates are amazed when Taehyung is under the water for well over a minute. Making the others worried that they should check on him to make sure he’s still alive. As they wait for the results, they find out that this last game was worth ten points. Which sends Yoongi into a mini rant about how it’s unfair and the ARMY won’t like it. Of course, Team A debates on that and says they always play like this. Of course Team Seokjin isn’t happy to learn that they lost the game but just one point. With Team A winning the whole game by just winning one round. That means that Jin, Yoongi, and Jimin have to go through the penalty of getting splashed with water by the other team. Namjoon gets to hit Yoongi with water, Jungkook gets to attack Jin with water, while both Taehyung and Hoseok splash Jimin! What was your favorite moment from ‘Run BTS!’ episode 62?